Film Udyog Se: HSK Entertainment & Namyoho Studios are coming together with new music official "Ve Sajna"
HSK Entertainment & Namyoho Studios are coming together with new music official "Ve Sajna"
Get ready to feel the soul touching track, a new music official by HSK Entertainment Pvt. Ltd. & Namyoho Studios, all together to promote the new talent of Music Industry. As they launched their latest track "Ve Sajna" out here in Delhi, sung by new voice Chirag Dahiya. Entire launch took place at Bunta Bar, Janpat Road, CP. 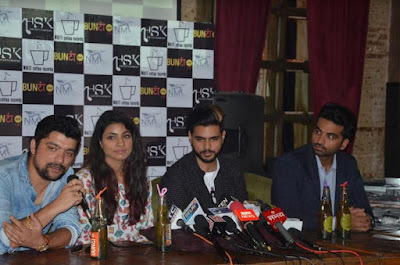 The event was graced by the presence of Bollywood singer Himani Kapoor, Music Director Manan Bhardwaj, Paramveer Kapoor, an artist manager and owner of HSK Entertainment. Along with Line producer Viraaj Rai Singh. HSK Entertainment as a part of its philanthropist vision has started promoting and supporting fresh talents who are truly deserving by providing them platforms & producing their music videos in collaboration with White Coffee Records, Namyoho Studios. HSK is signing artists and Chirag Dahiya is one of them, whose song “Ve Sajna” is finally released. Himani Kapoor who earned her fame through India’s biggest reality show ‘SaReGaMaPa 2005’ & song ‘Dum dum mast hai’ of the movie Band Baja Baraat, Bachna hai haseeno and many others. Whereas, Paramveer stated, “Our Company HSK Entertainment Pvt. Ltd. Incorporated in 2008 is into Event Management, Artist Management and Music Video Productions. We have organised more than 500 shows globally working with artists like Arijit Singh, Neha Kakkar, Sunny Leone, Himani Kapoor , Meiyang Chang, Himesh Reshammiya, Gippy Grewal & many more.” Talking about Chirag he added, “Chirag is a resident of Faridabad and an engineer in computer science. With passion for music since childhood, therefore, HSK signed artists and Chirag Dahiya is one of them, whose song ‘Ve Sajna’ is finally out now.” Whereas, Chirag seemed highly excited about his new venture. Well, featured under the banner of HSK Entertainment Pvt. Ltd, White Coffee Records & Namyoho Studios “Ve Sajna” is directed by Manan Bhardwaj, story writing by Dr. Bharti Sharma and sung by new talent Chirag Dahiya. Finally song is out now!